Whataburger Breakfast On a Bun is one of the most frequent ordered items when I am on the road. In fact, when I moved out of Texas for a few months, I wanted a couple of things, breakfast tacos, and Whataburger? What makes Whataburger so great? Good quality ingredients and the fact that what it should be hot is served hot. I know, its a minor quibble, but I really like hot french fries and a burger that doesn’t have that feeling that parts of it were prepared way before I ordered it. I feel like I could be a Whataburger commercial. When in doubt about where to get a lunch, this place often comes in mind. They will customize your order any way you like it. It doesn’t matter what you request is, they will do it right. I also love the fact that they have some of the best iced tea around. At one point in my life, I think I used to have to carve out a place in my budget for this restaurant. Their Breakfast On A Bun is a great example of their menu, this has a few ingredients in it, but they go together so well. I prefer mine with bacon, but this could also be served with a nice sausage patty instead of the bacon. I am using a wide mouth canning lid to keep the egg nice and uniform. While I have seen those really nice egg forms in stores, I thought they were a little overpriced for me. The wide mouth canning lid works very well. I have read you could use a tuna can with both ends cut off and use just the ring portion. If you want to serve your egg sunny side up, you will want to spray your ring with a little bit of non-stick spray, if not, flip the egg, and when the egg is done, run a knife around the rim of the lid, and this will set the egg free. 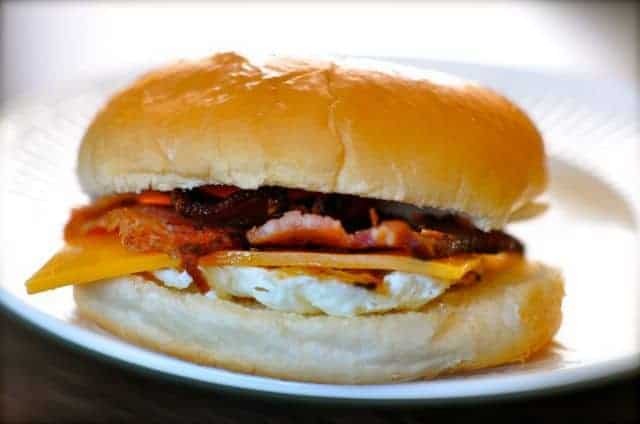 Make your own breakfast on a bun at home. Place a skillet over medium heat and cook two pieces of bacon on the skillet. Once the bacon grease has started to release some of the greases place a wide mouth canning ring onto the skillet. Crack one egg and place the egg inside of the canning ring. Continue to cook bacon and remove from pan when done, draining on paper towels. Flip the egg over and allow the other side to cook. The sandwiches are served with solid, not runny yolks. When the egg has finished cooking (it should take about 30 seconds once you have flipped it over), remove from pan. To assemble the sandwich place the two slices of bacon down on the bottom bun, you can break the bacon in half so it will fit the hamburger bun, add the egg, and then top with cheese. Place the top bun on top of the cheese. Stephanie, have you ever tried a `Pizza Burger – Flying saucer sryle? Stephanie, I think a hamburger bun for breakfast is a little too much bread. I prefer sourdough bread. Jack in the Box makes a good breakfast sandwich with sourdough bread as an option. I use to eat Whataburger in my home town in California in the 70’s. They changed to name I believe in the 80’s, but the burgers stayed consistent in deliciousness. I would love to know how to replicate their burgers. Take a thin frozen patty, season with the special seasoning (salt and pepper), then fry quickly on a griddle or hot skillet with a little oil. (Like a tsp per patty). Pull off just before it gets crispy. Top with fresh cut veggies. Butter and toast the bun. Add jalapenos and a little bit of salsa for a BOB Ranchero…a former Texan. Oh man, that sounds tasty! I love the Whataburger restaurants, I know they had been around for awhile. I wasn’t sure for how long. I have seen some of those other ones, I love the way they used to be built. As a former Texan and current North Carolinian, I have to say that these are two different Whataburgers. The NC drive-in has no affiliation with the Corpus Christi drive-thrus, though both are delicious! They are in a few more states than Texas. I love Whataburger, their iced tea is always fresh, and the fries are always hot. I eat a WB BOB at least once a week…with bacon. It is likely we will run into each other eventually.